"Our world is in a season of acceleration toward two momentous events: the greatest outpouring of the Holy Spirit and the greatest hour of pressure and trouble in all of history. " Mike Bickle shares in this very intriguing blog. "Isaiah said it clearly: "For the darkness shall cover the earth and deep darkness the peoples; but the Lord shall rise upon you, and His glory shall be seen upon you" (Isa. 60:2). A time of deep darkness is coming, yet at the same time, the glory of God will be seen on His people in an unprecedented way. In essence, Haggai prophesied the same thing, declaring that the Lord will shake heaven and earth, the sea and all the nations, and much more. In context to this global shaking, multitudes will come to the Jesus who will be seen as "the Desire of All Nations." For thus says the Lord of hosts: "I will shake heaven and earth, the sea and dry land; and I will shake all nations, and they shall come to the Desire of All Nations [Jesus]" (Hag. 2:6a-7b, NKJV). In other words, the greatest harvest of souls is coming in context to the end-time shaking of the nations. This shaking will be like a "perfect storm" affecting many areas of life—financial, political, societal, spiritual, military and much more. The generation of Jesus' return will have unique dynamics. There is only one generation that will see both the greatest revival and the greatest pressure in all history occurring at the same time. Thus, two great extremes come together in one timeframe. The dynamics are unique—nobody has ever walked that path before. No other generation in history has had to navigate these two extremes. That is why the Lord put so much information in the Bible about that generation, so it is not surprising the Scripture highlights that particular generation much more than others. In fact, God's plan for the generation in which Jesus returns is the main focus in over 150 chapters in the Bible (see mikebickle.org/resources/resource/2888for a list of these). To get a perspective on how important these 150-plus chapters are, consider that there are 89 chapters in the four Gospels that focus on Jesus' first coming to accomplish salvation. In contrast, more than 150 chapters in the Bible focus on what will happen when Jesus returns to openly rule the whole earth. (That one generation includes the decades leading up to Jesus' return and the decades immediately following it). God's people easily receive the good news about a coming great revival. The challenge lies in interpreting the unprecedented pressures without being afraid or offended by the many negative events that will occur. Thus, God's people must understand the biblical narrative related to the coming pressure, or they will be left, by default, to embrace a secular narrative. The secular narrative of current and future events is presently being expressed through many different media outlets. The problem with this narrative is that is based on many wrong ideas leading to many wrong conclusions. Some present ideas that are overly optimistic, refusing to acknowledge what the Bible says about the coming pressure. Others go to the other extreme and are overly pessimistic. Only by embracing the biblical narrative will God's people be able to process the pressures in a way that will help them to grow in love and faith with a steadfast hope in God. Believers not grounded in the biblical narrative about the end times often promote the secular narrative or the secular interpretation of the increasing crisis. In fact, far too many in the church are almost totally unaware of the biblical narrative in these more than 150 Bible chapters. Understanding the biblical narrative includes more than knowing a few general ideas about the end times; most are familiar with the fact of a coming Antichrist, the Great Tribulation, and the rapture. But the Scripture has much more to say about what will happen in that generation and why. People will respond according to the narrative they embrace. Those who don't understand the biblical narrative or storyline of unfolding events will be confused and even afraid. Many are perplexed as to where things are going as they seek to interpret society's increasing pressures and troubles. To them, it seems like the train of history is veering off the tracks, and it feels as though no one really knows where things are going or why. I have good news! The very God who can accurately predict the specific details occurring in the end times is the same God who has authority over them and can overrule the negative events causing them to work for the good of His people (Rom. 8:28). Since God has total control and deeply loves His people, we are in His good hands. We can stand in faith, filled with peace and thriving in love. Only those who interpret what is happening from God's point of view can respond with such faith and confidence. There are also pastoral reasons we should pay attention to these 150 chapters of the Bible. I identify four negative responses Jesus warned the end-time church to be prepared to overcome. Again, I emphasize that people must understand the biblical narrative of what will happen or they will be left, by default, to embrace a secular narrative of the increasing pressures and crisis events, making them more vulnerable to be overcome by fear, offense, lust, and deception. 1. Fear: Jesus warned that men's hearts will be overcome with fear in the end times if they are not properly equipped in the Word and walking in the Spirit. This warning applies to both believers and unbelievers. People who are overcome with fear are far more vulnerable to make terrible decisions. The Bible speaks of "men fainting from fear and expectation of what is coming on the inhabited earth" (Luke 21:26a, MEV). 2. Offense: Many will be offended at God and one another in context to the escalating pressures. People who are offended at the Lord cannot respond to Him with strong faith and wholehearted love. Some will be offended at Jesus' leadership because they grew up in a church that taught that things were mostly only going to get better or the Lord would rapture them before the trouble increased too much. Thus, they will question Jesus' leadership and whether the Bible is true. "And then many will be offended, will betray one another, and will hate one another" (Matt. 24:10, NKJV). 3. Lust: Jesus warned His people not to allow their hearts to be weighed down with carousing and drunkenness. The word for "carousing" speaks of self-indulgence, with the main idea being immorality. Often people who are overwhelmed by fear or offense seek to find temporary relief from their pain in drunkenness, drugs, and immorality. The explosion of immorality in our culture will intensify even more as internet technology provides many with opportunities to engage in it. "Take heed to yourselves, lest your hearts be weighed down with carousing [lust], drunkenness ... and that Day come on you unexpectedly (Luke 21:34, NKJV). 4. Deception: Jesus prophesied that the enemy will use false prophets for his deceptive purposes. "Then many false prophets will rise up and deceive many" (Matt. 24:11, MEV). Do not think of false prophets as only cult leaders and crazy eccentric people with bizarre religious ideas. I believe some of the most dangerous false prophets will be popular social reformers and media personalities who are dignified, cool, caring, intelligent and well-spoken. They will be very persuasive in their social commentary and in their call for new values and perspectives on social and sexual issues. They will come across as logical and even loving to those not grounded in God's Word. They will seek to rescue people and society from "old-fashioned" biblical values and perspectives. The enemy is raising new popular voices to spearhead counterfeit justice movements or mercy movements that claim to excel in love. They will use the biblical terms "justice, unity and love," but not in the same way the Bible defines them. These false voices will lead many people away from Jesus, the God of the Bible. "Now the Spirit clearly says that in last times some will depart from the faith and pay attention to seducing spirits and doctrines of devils" (1 Tim. 4:1). The combination of escalating fear, offense, lust, and deception will result in some believers falling away (1 Tim. 4:1-2; 2 Tim. 3:1-7, 4:3-5; Heb. 6:4-6, 10:26-31, 39; 2 Pet. 2:1-3, 20-22, 3:17). People who become fearful or offended are far more vulnerable to drift away from their faith because they are not able to make sense of the increasing pressures and troubles in the world. Paul presented the end-time falling away as obvious and as significant as the appearing of the Antichrist on the world stage. "Do not let anyone deceive you in any way. For that Day [Jesus' return] will not come unless a falling away comes first, and the man of sin [Antichrist] is revealed" (2 Thess. 2:3). The Lord was gracious to give His people information about these increasing pressures with important details about the generation of His appearing. The biblical signs of the times include events and trends predicted in Scripture. In Matthew 24, Mark 13 and Luke 21, Jesus identified 22 signs of the times—and 20 of them are negative. The Old Testament prophets, Jesus and the apostles prophesied of the signs of the times to alert God's people who are alive in the generation of His return that His return is imminent. Now, for the first time in history, most of these signs are increasing and making global headline news. When all the signs accelerate at the same time, God's people are to know they are living in the generation of Christ's return. The first mention of "all these things" (Matt. 24:33) refers to the signs of the times before and during the Great Tribulation (Matt. 24:5-28). The second mention of "all these things" (Matt. 24:34b) refers to what occurs after the Great Tribulation, at the time of Jesus' return (Matt. 24:29-31). "So also, when you shall see all these things, you know that it is near, even at the doors. ... this generation will not pass away until all these things shall take place" (Matt. 24:33-34). It is possible that there are people alive on the earth today who may see Christ's return. It is not too early to become more familiar with the biblical storyline in the 150 chapters on the end times. The Lord promised to raise up people who will understand His end-time plans perfectly (see Jer. 23:20). To understand the end times perfectly means to have a mature understanding of what the Scripture says about the end times. "The anger of the Lord [His judgments] will not turn back until He has executed ... the thoughts of His heart. In the latter days, you will understand it perfectly" (Jer. 23:20). We can only have a mature understanding as we honor, relate to and learn from one another across the different streams in the body of Christ. No one group will have it all, but together, the body of Christ can gain a mature understanding. I believe that only in the collective wisdom of the body of Christ across the nations can we have a full understanding of the end times. We need each other to grow in strength and understanding. We can be confident that the anger of the Lord against the Antichrist's empire will not be turned back until God has executed and performed all the thoughts and plans of His heart. At that time, God's people will understand perfectly. There is power in knowledge. We don't have to be confused. By having a robust biblical picture of the unique dynamics of the end times, God's people will be equipped to have the right expectations and interpretations of various negative events. By understanding the biblical narrative, God's people will have the tools to process escalating pressures in a way that will help them to thrive spiritually and grow in love and faith. The Lord promised to raise up "people of understanding" who will help others understand the biblical narrative related to the end times. "And those of the people who understand shall instruct many" (Dan. 11:33a, NKJV). This passage had a partial fulfillment in the days of Antiochus IV Epiphanes (175-163 B.C. ), but the complete fulfillment will come in the end times. The promise to be "one of the people of understanding" is available to any believer in Jesus who will search out what He says in the Scriptures. Remember, there are over 150 chapters in the Bible whose main focus is on the generation of the Lord's return. "Many," or multitudes, will be hungry for answers from God's Word. The Lord's messengers will make the biblical narrative known in diverse ways to "many" in the body of Christ and to the uninstructed millions of unbelievers hungry for understanding. This information is to be used evangelistically in a way that may surprise us. 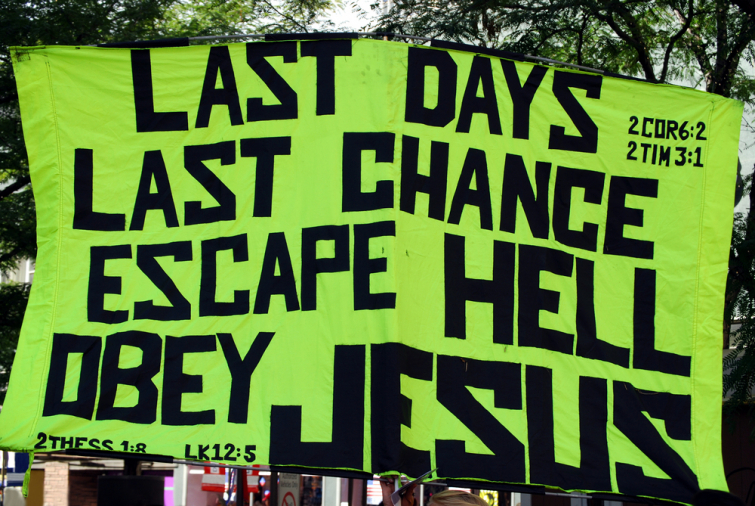 Unbelievers are interested in knowing what the Bible says about the end times. By growing in understanding, we can be a part of the solution instead of adding to the confusion of those who embrace the secular narrative and are overcome with fear, offense, lust or deception." Mike Bickle concludes his blog.